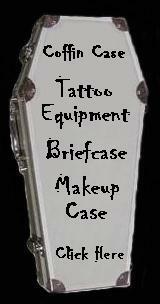 Click on the Coffin Cases above for Case Styles. 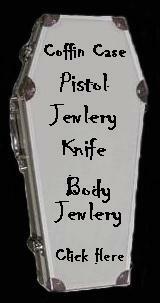 I wouldn’t be caught Dead without mine. This clock has a 9" diameter by 2" deep blood red frame with a 7" diameter face. 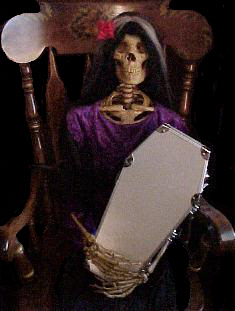 Marcy the Coffin Girl is the center figure of the clock surrounded by 8 skulls and 2 coffins. This clock has a 9" diameter by 2" deep black frame with a 7" diameter face. Betty the Coffin Girl is the center figure of the clock surrounded by 8 skulls and 2 coffins. The Coffin Girl Clocks are each $19.95 with Free priority mail shipping in the U.S.
We understand that internet shopping restricts the ability to examine your purchase before commitment. We allow 30 days to return any product that you are not pleased with for a full refund, as long as it is returned in resalable condition. Shipping charges cannot be reimbursed.